Twice a month, my husband and I have been hosting a “Salsa Friday” night with friends and neighbors. Selfishly, we love getting to know people and we love chips and salsa, so this event provides us expansion of both! Last week, my friend sent me a recipe she found for the upcoming event. She knows how much we love Chevy’s Fresh Mex chips and salsa. She found a recipe that claimed to be a valid comparison. I was wary, I’ve read and tried a few copy cat recipes without anything close to the original. 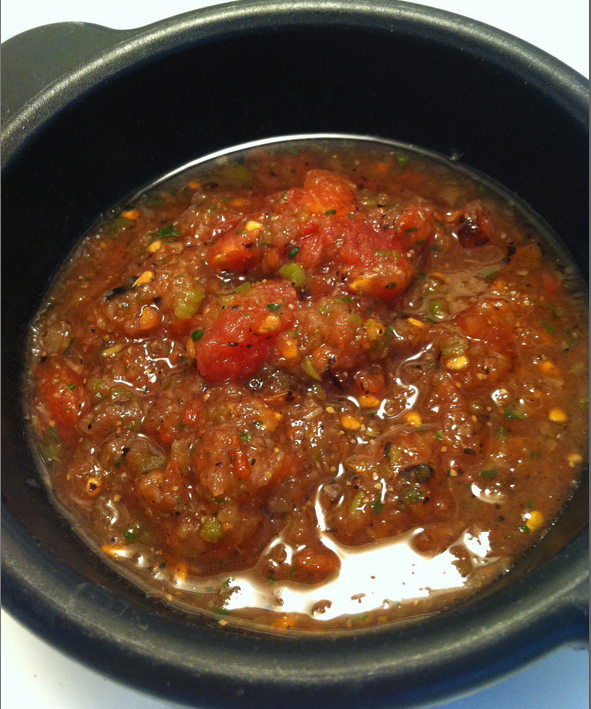 However, as we’ve cultivated our Salsa Friday, I’m always eager to try out new combinations and salsas. I’m happy to report the results were wonderful! It is by far the closest recipe we’ve found to Chevy’s version and it tasted great! Cut onion in half. Roast onion halves, whole tomatoes and whole jalapenos over an open flame until skins get begin to develop a black charring. (I roast mine directly on my gas stove burners, turning with a metal tong) Place veggies on a cool cookie sheet to rest and cool. Prepare the cilantro in a small bowl (I use kitchen shears to cut the cilantro into pieces), add the pepper, salt and garlic to the same bowl. Set aside.